(Sainte-Julie, Quebec, August 27, 2009) – A brand new, $6 million dollar, state-of-the-art Lexus dealership will open its doors in Sainte-Julie, Quebec at 1833 Armand Frappier Blvd. With a 21,000 square foot facility, Lexus Sainte-Julie is expected to employ 25 staff when it opens to the public in early 2010, and will be committed to providing excellent customer service in new vehicle sales, Lexus Certified Pre-Owned vehicle sales, as well as parts and service operations. Dealership guests will experience convenient and uncompromising service features, including service drive-thru and appointment pre-booking, and upscale alternative transportation, including luxury door-to-door shuttle service and Lexus vehicles available on loan. The dealership will also feature a dedicated interior vehicle delivery area, and a sophisticated Lexus Club Lounge to ensure every visit to Lexus Sainte-Julie comes complete with more perfect moments. Lexus Sainte-Julie will offer a wide selection of Lexus vehicles and exceptional service for its guests. Lexus vehicles embody the L-finesse design philosophy and intuitive technologies, delivering more advanced motoring experiences and perfect moments. The Lexus Sainte-Julie dealership staff will offer its guests sales associates well-versed in delivering perfect moments and personalized, expert advice, while highly-skilled, factory-trained service technicians using Genuine Lexus parts and accessories will ensure that every return visit is a memorable Lexus experience. Whether shopping for a brand new Lexus HS 250h hybrid sedan - the latest Lexus Hybrid Drive model that delivers the future of luxury motoring through sustainable, intuitive technologies - or the advanced Lexus RX 350 SUV, crafted in Cambridge, Ontario at the world’s only Lexus manufacturing facility located outside of Japan, Lexus Sainte-Julie will provide the highest level of personalized, quality service. To mark the official beginning of construction on the new dealership, a groundbreaking ceremony will take place Thursday, August 27 and will include special guest Yoichi Tomihara, President of Toyota Canada Inc.
As a member of Canada’s leading automotive team, Lexus Sainte-Julie is part of a strong network of independent Lexus dealers. With 50 years of experience in the automotive business, Dealer Principal Norman Hbert has been serving customers in the Montreal area and is deeply involved in the community, supporting local programs, such as Centraide, Concordia University and many local South Shore charitable organizations. He is also a member of the Sainte-Julie Board of Trade. Lexus in Canada is the exclusive Canadian and distributor of Lexus luxury cars and sports utility vehicles through a sales and service network of 30 dealers across Canada. An industry leader for product quality and ownership satisfaction since its inception, Lexus has sold over 120,000 vehicles in Canada. Delivering more perfect moments of advanced motoring, the best-selling Lexus RX 350 SUV fusing intuitive technology and L-finesse luxury, is built for the North American market in Cambridge, Ontario, the first and only Lexus manufacturing facility located outside of Japan. For more information about Lexus products, and Lexus’ pursuit of perfection, visit www.lexus.ca. For media contacts, images and specifications please visit www.media.lexus.ca. 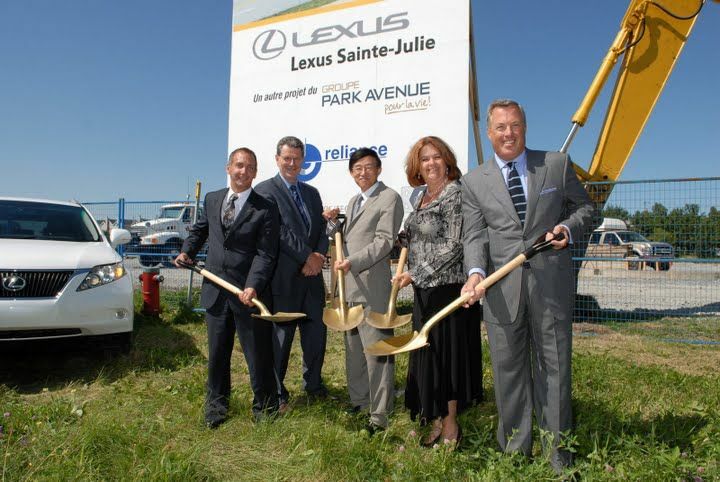 Groundbreaking for the new Lexus Sainte-Julie dealership, Sainte-Julie, Quebec. Yoichi Tomihara, centre, President of Lexus in Canada, is joined by members of Groupe Park Avenue and the new dealership, including Norman Hébert, far right, Dealer Prinicpal of Lexus Sainte-Julie. 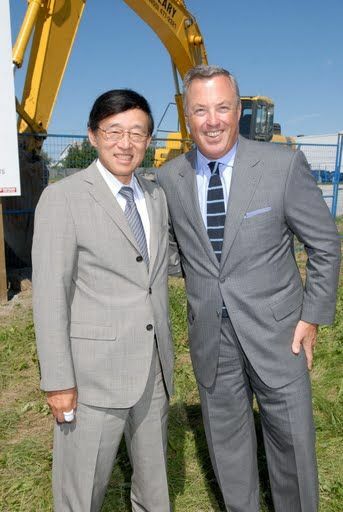 Yoichi Tomihara, President of Lexus in Canada, is joined by Norman Hébert, Dealer Prinicipal of Lexus Sainte-Julie at the official groundbreaking for the new site.